Speaker Paul D. Ryan’s retirement announcement Wednesday sparked a public scramble for a successor to match his fundraising prowess and to serve as the House GOP’s political and policy chief in the age of President Donald Trump. Though the Wisconsin lawmaker has pledged to stay in office through the end of the term in early January 2019, some GOP insiders on and off the Hill question whether he can remain an effective fundraiser and political leader during a nearly nine-month lame-duck period. 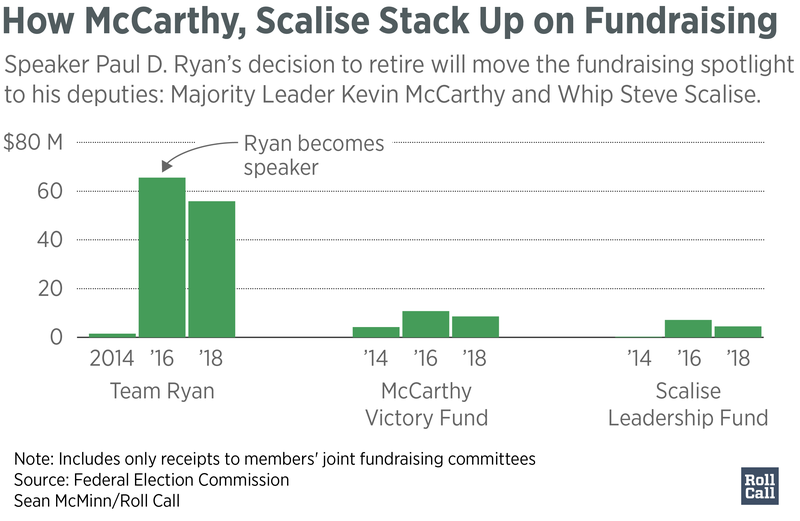 Majority Leader Kevin McCarthy of California and Louisiana’s Steve Scalise — the candidates most likely to replace him as speaker or, potentially, as minority leader — may have months to bolster their fundraising coffers and make their pitch to fellow House Republicans. Then again, they may have much less time than that. Already, K Street players say in interviews that they fear Ryan’s announcement itself may hurt the party’s fundraising in the run-up to one of the party’s toughest campaign seasons in more than a decade. The GOP’s grip on the House is considered at risk in the November elections because of liberal mobilization, especially against Trump. Ryan’s announcement comes at a sensitive time for the party’s political donors. Ryan has been a prolific fundraiser for Republicans, besting even his predecessor John A. Boehner of Ohio. Ryan’s joint fundraising committee, Team Ryan, hauled in more than $11 million in the first quarter of this year, his political operation said. He has said he will continue to raise money for the party and campaign for House Republicans. Not only did Ryan rely on the built-in money-raising advantage of the speakership itself when he took the job in October 2015, but he also had a leg up as the GOP’s vice presidential candidate in 2012, offering him uncommon entrée to nationwide donors. Neither McCarthy nor Scalise has that advantage. McCarthy, though, has the pull of donor-rich California, while Scalise has a dramatic story after having survived the apparently politically motivated shooting a year ago during the GOP’s practice for the Congressional Baseball Game. Scalise, who serves as the House GOP whip, so far this cycle has raised less money than McCarthy — but it is worth nothing that Scalise spent months last year recuperating from his injuries and suspended much of his fundraising efforts during that time. As for the timing of succession, some GOP insiders said Ryan can now operate without worrying whether his speakership is in danger. But Ryan’s leadership authority, given his announcement Wednesday, could well be compromised. How will he, say, ask his fellow Republicans, some of whom are in the toughest political races of their careers, to take difficult votes when he himself is headed for the exit? Trump is said to enjoy working with McCarthy, whom he calls “My Kevin,” according to news reports. Trump has also praised Scalise and visited him in the hospital. McCarthy is viewed as loyal to the president, even offering Trump advice about how to weather a scandal in the final weeks of the 2016 campaign when a videotape surfaced of him making vulgar comments about women. “The president deserves to have the speaker of the House that he wants,” said lobbyist Sam Geduldig, a partner with the CGCN Group and a former House Republican leadership aide. As for Ryan’s future, the current speaker has built up much goodwill among the nation’s business community, mostly for helping shepherd last year’s tax overhaul into law. As members of the House GOP consider the future of their leadership roster, Ryan himself — and his current aides — will embark on an effort to figure out their next steps. Ryan has told people that he’ll figure that out next year. His aides, meanwhile, could easily find other roles on the Hill or in the private sector. “Both he and his staff will have no problem making the transition into the private sector,” Adler added. Like other former speakers who leave Congress, including Boehner, Ryan will have access to a taxpayer-funded congressional office and staff. Boehner closed out his office in the fall of 2016, after joining the law and lobbying firm Squire Patton Boggs. Republican Rep. Walter B. Jones of North Carolina introduced legislation to remove that post-speaker perk, but it has not moved. Another question remains about what Ryan can, and will, do with his massive pile of political money. His re-election fund — which had more than $10 million as of March 31, according to Federal Election Commission records — has the most restrictions, said Chris DeLacy, a campaign finance lawyer with Holland & Knight. Most former members, especially those who go into lobbying or policy work, tend to use their political money, including leadership political action committees, as something of a “personal PAC,” said DeLacy, using them to dole out contributions and also to fund political travel. Leadership PACs, unlike re-election campaign funds, don’t have restrictions on personal use, said DeLacy. They can also give money to charity, DeLacy noted. “There’s a lot of possibilities for what you can do with a leadership PAC when you leave office,” he said, though most people keep it related to political work.